Computing from beautiful, Northern California. 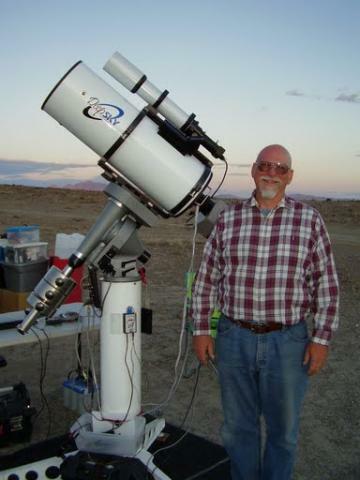 I have maintained an avid interest in all things astronomical since I was 12 years old and got my first telescope. I just recently built new computers with modern hardware and operating systems. Felt it was finally time after 6 years. Have to say that the processing power of a multi-core CPU and GPU computer is impressive. I also have attached to the MilkyWay@Home and Einstein projects because I feel the projects are relevant to my interests in astrophotography and the need for up-to-date maps of the galaxy. These projects allow me to contribute my unused CPU cycles on my workstations. SETI@Home lets me vicariously 'view' through the Arecibo and Green Bank radiotelescopes and MW puts to good use the datasets coming off the SDSS. The image is of my SBIG STL-11000M CCD camera and a new astrograph, the DSI RC10C to capture a wider image area. 1. I heard about SETI@Home Classic from my OS/2 user group newsletters and news sources back in 2001.
methodology and monitoring. That got me started. I have converted my five workstations over to Linux now. production with the upgrade to a Ryzen 2700x CPU. hopefully foster a life-long interest in science. POWER!!! Watch out for that Bulldozer!